Dinkelsbühl is a historic town in Central Franconia, a region of Germany that is now part of the state of Bavaria, in southern Germany. Dinkelsbühl is a former Free imperial city of the Holy Roman Empire. 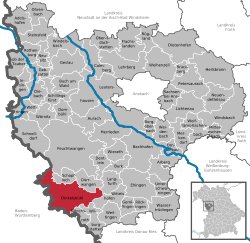 In local government terms, Dinkelsbühl lies near the western edge of the Landkreis (or local government district) of district of Ansbach, north of Aalen. 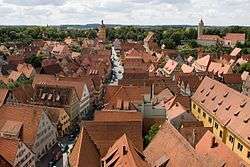 Dinkelsbühl lies on the northern part of the Romantic Road, and is one of three particularly striking historic towns on the northern part of the route, the others being Rothenburg ob der Tauber and Nördlingen. Fortified by Emperor Henry V, in 1305 Dinkelsbühl received the same municipal rights as Ulm, and in 1351 was raised to the position of a Free Imperial City. Its municipal code, the Dinkelsbühler Recht, published in 1536, and revised in 1738, contained a very extensive collection of public and private laws. 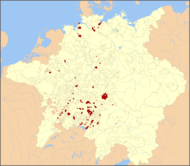 During the Protestant Reformation, Dinkelsbühl was notable for being – eventually along only with Ravensburg, Augsburg and Biberach an der Riß — a Bi-confessional (i.e. 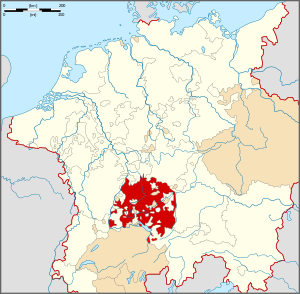 roughly equal numbers of Roman Catholics and Protestant citizens, with equal rights) Imperial City (German: Paritätische Reichsstadt) where the Peace of Westphalia caused the establishment of a joint Catholic–Protestant government and administrative system, with equality offices (German: Gleichberechtigung) and a precise and equal distribution between Catholic and Protestant civic officials. This status ended in 1802, when these cities were annexed by the Kingdom of Bavaria. 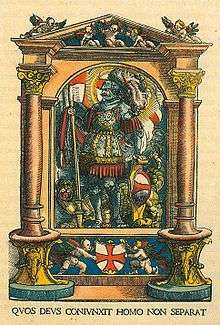 Around 1534 the majority of the population of Dinkelsbühl became Protestant. Every summer Dinkelsbühl celebrates the city's surrender to Swedish Troops in 1632 during the Thirty Years' War. This reenactment is played out by many of the town's residents. It features an array of Swedish troops attacking the city gate and children dressed in traditional garb coming to witness the event. Paper cones full of chocolate and candy are given as gifts to children. This historical event is called the "Kinderzeche" and can in some aspects be compared with the "Meistertrunk" in Rothenburg. 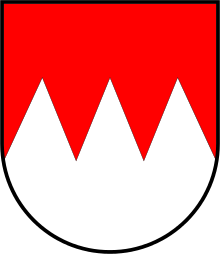 The name is derived from the two German words for "child" and "the bill for food and drink in an inn", and is called such because of the legend that a child saved the town from massacre by the Swedish Troops during the surrender. The legend tells that when the Swedish army besieged the town, a teenage girl took the children to the Swedish general to beg for mercy. The Swedish general had recently lost his young son to illness, and a boy who approached him so closely resembled his own son that he decided to spare the town. Remarkably, Dinkelsbühl remained totally unscathed, except for a broken window in St. George's Minster. The film, The Wonderful World of the Brothers Grimm (1962), was filmed on location in Dinkelsbühl. Dinkelsbühl is still surrounded by the old medieval walls and towers. There exist a lot of outstanding attractions. The image of this town is very typical for a German town of the 15th to early 17th century. St. George's Minster is a beautiful masterpiece in the Gothic style of the late 15th century ( by Nikolaus Eseler ). It is the largest "hall church" (one built without aisles) in the country. St. Paul's, now a Protestant church, was rebuilt in the 19th century in the style of the far late Roman architectural style. It was originally part of a monastery. The Castle of the Teutonic Order has a rococo chapel. The so-called Deutsches Haus is the ancestral home of the Counts of Drechsel-Deufstetten. It is a fine specimen of the German renaissance style of wooden architecture. Situated in front of the Minster is a monument to Christoph von Schmid (1768–1854), a 19th-century writer of stories for the young. Museum of the 3rd Dimension is housed in the former city mill. The Museum of History shows historical discoveries found within Dinkelsbühl and also has reconstructions of the ancient houses of the city. Since 2008, the museum has had a new domicile in the so-called "Steinerne Haus" from the 14th century. The official name is now: "house of history". While many of the artifacts are the same, the presentation is completely new. The church of St. Vincent, which is 2 km outside the city. The Summer Breeze Open Air heavy metal festival has been held in Dinkelsbühl since 2007. Nikolaus von Dinkelsbühl, A theologian during the 14th and 15th centuries. Christoph von Schmid, writer during the 18th and 19th centuries, was born in Dinkelsbühl in 1768. Friedrich von Hermann, an economist and statistician, was born in Dinkelsbühl in 1795. Stefan Reuter, football world champion in 1990, was born in Dinkelsbühl in 1966. Architect of Dissonance, brutal death metal band founded in 2011. 1 2 One or more of the preceding sentences incorporates text from a publication now in the public domain: Chisholm, Hugh, ed. (1911). "Dinkelsbühl". Encyclopædia Britannica. 8 (11th ed.). Cambridge University Press. p. 277. Wikimedia Commons has media related to Dinkelsbühl.